I've mentioned the canning of craft beer before, but I feel the need to bring it up again because I'm perplexed. I fail to understand the pricing strategy with canned beer. I'm not alone. Just to review, it seems completely reasonable to me that more good beer should come in cans. The myth of canned beer tasting bad has been widely debunked. Modern cans use a liner that keeps the aluminum and the beer separate. In fact, cans completely protect beer from light, the most significant cause of beer degradation in shipping and shelving. As I noted in my earlier post, cans are convenient. They're less prone to breakage when dropped or jostled around. They are light and compact. You can take canned beer places you would never take bottles. They are also easier to display on store shelves because they can be easily stacked. Beyond convenience, cans offer are environmental benefits. Aluminum is the most recycled form of packaging worldwide. About 44 percent of an average aluminum can comes from recycled material. Obviously, cans are lighter and less costly to ship. Less energy is used in the aluminum can loop than with glass. Given the various positive factors, I keep wondering why canned beer seems to cost more than bottles. I consistently see six-packs of cans priced between $9 and $12. Nearby, six-packs of similar bottled beer are selling for $8 to $10. What's up with that? I've asked around. Nobody has a reasonable answer. Does canned craft beer cost more because it's relatively new and the start-up costs are high? Well, this movement has been underway for several years. There's mobile canning out there now, so investment in an expensive canning line shouldn't be an issue. If it was an issue for places that jumped in early on, you'd think the start-up costs would be paid down by now. Does it cost more because it's a novelty that can be priced higher with no effect on sales? If that's that case, craft beer in a can may stay a novelty. The current pricing structure offers little incentive to consumers who are open to switching to cans. What about buying discounts? 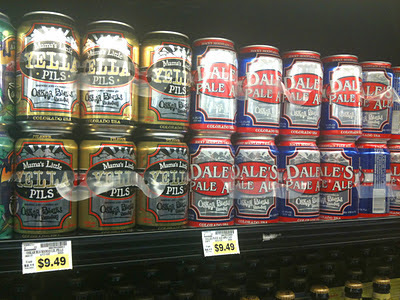 Are higher prices the result of retailers buying less craft beer in a can? It's easy understand why retailers might be reluctant to move away from bottles. Beer consumers have been conditioned to believe any beer in a bottle is better than the same thing in a can. My thoughts? Even though canned craft beer makes good sense to me, the only solid selling point it has at the moment is convenience. For the movement to really take off, prices of cans will need to align fairly closely with prices on bottled beer. I've heard canning is better on the long term as far as profit margins go but initially is much more expensive (less of a market for small time canning lines), which discourages smaller breweries as it's a large investment. That's only what I have heard or maybe pieced together on my own though. Green bottling should have a mobile canning line (that could be a good business). I think it is selection: Canning lines are much cheaper than bottling, so smaller, less efficient breweries are canning. Those breweries that can package in 12oz sixers are the bigger, more efficient breweries. I think you have to compare like breweries and there the price disparities are not large. For example Ft. George Vortex IPA at $12 for four 16oz cans is still better than a $5 220z bomber. A $12 six pack is better than a $4 22oz bomber. I just noticed this the other day. I was reaching for a 6 pack of Avery's (Cans) and my hand instinctively pulled back as if I was sticking it into a campfire (after I saw the price) I think it was priced at $10.99. I opted for a 6 pack of bottled Ninkasi for $8.99. $13.50 for 16 oz. (x 4) at $12. $16.36 for 22 oz. at $5. $13.09 for 22 oz. at $4. I think there is more to it than Patrick's efficiency argument. 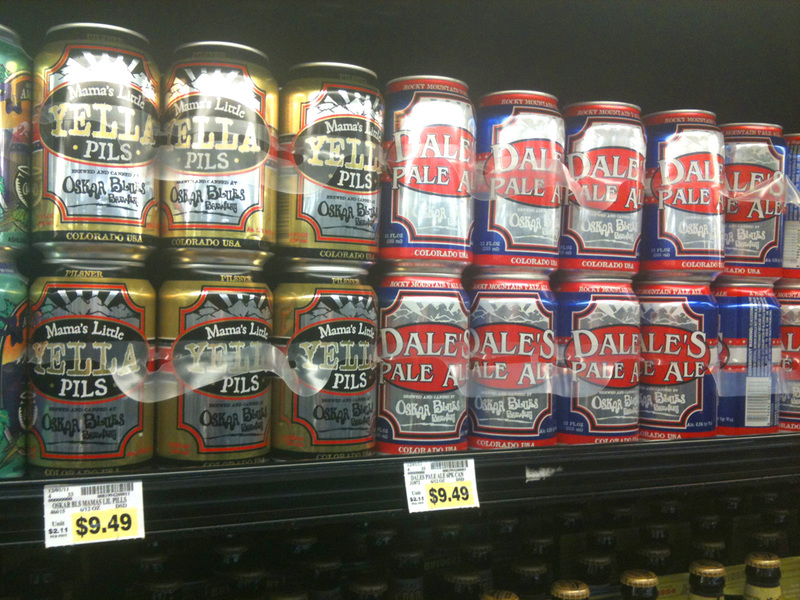 Why is Ft. George's SPE 35% higher than Caldera's canned six packs, and 3.5% higher than Lompoc's $4 bombers? Furthermore, I would expect Hopworks to move higher volumes than Lompoc, and yet their bombers are $5. It seems like there are other factors at play. Well, we know Avery isn't a small brewery, so the argument that smaller, less efficient breweries opt for cans doesn't fly. Avery beers are widely available in bottles, so I suspect they are just using cans to fill the convenience niche. I tried to stay from comparing 16 oz cans with bomber bottles. It seems to me you have to get as close as you can (haha) to comparing apples to apples. So you have to look at 12 oz cans vs 12 oz bottles. There is a clear price disparity there. Maybe it's because the places that do lots of 12 oz sixers, relatively big guys like Widmer, Deschutes, etc., do so much volume that they've brought the cost down. If they did that business in cans, the beer would be cheaper than bottles, which is usually the case with macros. Bomber pricing is a subject all its own. I'd love to do a serious investigation into the factors that determine prices, which are all over the place.